I have known many a Deadhead, and I’ve loved ‘em—friends and friends of friends; I’ve hung out in parking lots, at parties and campsites, and done what ‘Heads do in such gatherings. And yet, to paraphrase St. Paul, I was in the scene but not of it, never one of the faithful, just a hanger-on in a world that bemused me, listening to music whose intense appeal I didn’t quite get. Don’t get me wrong; I thought the first album was a country-rock classic. But that’s where my Dead knowledge ended. Of the two sixties bands who both once called themselves The Warlocks—The Dead and The Velvet Underground—my psychedelic tastes ran decidedly in the East Coast direction. So I’m probably as far as it gets from an expert on the labyrinthine world of Grateful Dead bootlegs. But I have to admit, just like the parking lot scene the young, aloof me observed through the eyes of my old hippie friends, I’m intrigued and a little intimidated by the obsessive cataloguing of Deadhead fandom. My teenage punk-rock self admired the DIY ethos, despite serious stylistic misgivings, and now as a grown-up who couldn’t care less about labels, I’m finding the time to go back and re-listen to some of those bootleg recordings. I’m catching up on the history of live Dead by reading Nick Paumgarten’s exhaustive “Deadhead: The Afterlife” article in The New Yorker, and luckily for me, and for the real fans too, the days of trading tapes are gone. Hundreds of hours of live concert audio now exist in the Internet Archive. 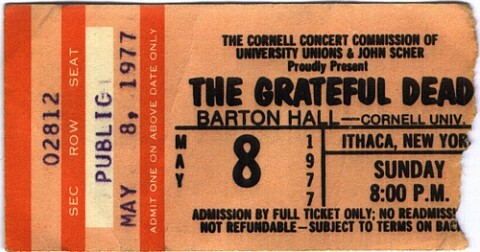 One of those concert recordings---the May 8, 1977 Barton Hall/Cornell University gig available above in its entirety---is said by some to be the “ultimate bootleg.” I’m in no position to judge, so I’ll quote the Library of Congress’s National Recording Registry, who write that this recording “has achieved almost mythic status among ‘Deadhead’ tape traders because of its excellent sound quality and early accessibility.” The LOC also points out that “fans of the Grateful Dead will never completely agree about which one of their over 2,300 concerts was the best.” Debates like this can, and should, go on forever. If they didn’t, whole subcultures would shrivel up and die. The armchair anthropologist in me thinks that would be a shame. The music fan (and inner hippie) in me is happy to groove to whatever catches my fancy these days, and I’m getting down to this one, for sure. Note: You can find more information on the Barton Hall/Cornell concert here. And here you can find 13 essential bootlegs selected by Nick Paumgarten, complete with links to audio from the concerts. Yes, this is a stellar show; that said, the Grateful Dead’s longtime producer and recordist Betty Cantor-Jackson made this historic recording, and since it likely wouldn’t exist without her efforts, it would be nice if people gave credit where credit is due.